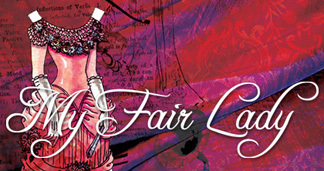 Next up at Stoneham Theatre is the classic Broadway musical “My Fair Lady” from April 8 - May 2. Caitlin Lowans will direct this production of the famed Alan Jay Lerner and Frederick Loewe masterpiece, based on George Bernard Shaw's "Pygmalion." The cast will be led by Robyn Lee and Timothy John Smith. When self-absorbed professor Henry Higgins wagers that he can make a proper lady out of Cockney flower girl Eliza Doolittle, Eliza and Higgins find themselves embroiled in a transformation that neither could have anticipated. Lowans has stated she is particularly interested in delving into the original impetus behind Shaw’s intent, unearthing the elements that provoke a strong-willed man to match wits with a strong-willed woman. In this interpretation, the usual fanfare will be meticulously deconstructed to reveal the raw elements of the complicated relationship. The company will also feature Paul Farwell as Alfred P. Doolittle, Ann Marie Shea as Mrs. Higgins, Russell Garrett as Pickering, and a large vocal ensemble. The original production of "My Fair Lady," starring Julie Andrews and Rex Harrison, opened on Broadway in 1956 with a score that included such songs as "The Rain In Spain," "Wouldn't It Be Loverly," "On The Street Where You Live," "Get Me To The Church On Time," " I Could Have Danced All Night" and "I've Grown Accustomed To Her Face." Praised for having created "one of the 'loverliest' shows imaginable," lyricist Lerner and composer Loewe are also known for such time-honored musicals as "Camelot," "Brigadoon," "Paint Your Wagon" and "Gigi." Stoneham Theater is located at 395 Main Street in Stoneham. For tickets and information, call 781-279-2200 or visit www.stonehamtheatre.org.